A new roadway that can *fix* ("when heat is applied") it self when it has a pothole. It says the roadway is 25% more expensive. This is revolutionary. How steel would affect tire lifetime? How would (cheap, I suppose) steel rust? Would material be as dense after reheat without applying pressure, or heater would need an integrating roller? 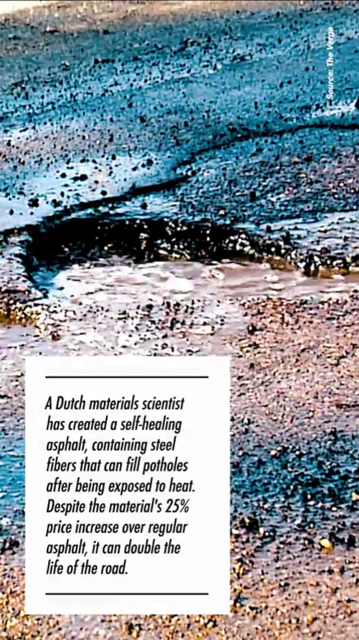 I guess there are some more issues between the demo and paving of interstate..
Materials scientist Erik Schlangen, chair of Experimental MicroMechanics at Delft University of Technology, is working on self-healing asphalt. He mixed steel fibers with asphalt to make the material conductive, and then when a large induction machine is run over the asphalt, heat helps close any cracks. The Verge pointed out since the machine is necessary, the asphalt isn’t entirely self-healing, but it does allow for easier repairs. Self-healing asphalt is undergoing testing on 12 roads in the Netherlands; one has been open since 2010 and all are in excellent condition. Regular asphalt roads tend to stay in good condition for seven to 10 years, however, so Schlangen said in upcoming years the difference will be clearer. He said self-healing asphalt could be 25 percent more expensive than typical asphalt, but could last twice as long. The conductive material within the asphalt structure would have to be electrically isolated from the adjoining earth base (possibly via a non-conductive substrate) or any current applied to it would just see an effective ground and drain away without any effect. Now -- if the steel material was arranged in such a way as with a wirewound resistor (in a tight coil), then current would have to go through a relatively large resistance on its way to ground and thus heating up the "virtual resistor" -- and ostensibly achieving the goal of melting the surrounding asphalt. It'd be tricky to apply, and more apt to be used in new construction or complete rebuilds rather than simple asphalt overlays. Personally, I'd like to see this concept tested in the US; it is a novel solution to a persistent problem. Now -- whether adding a conductive (or semi-conductive) plane to the pavement might disrupt communications poses an issue that will need to be addressed before any mass deployment of this technology takes place! Well looks like this Thread just got revived. Check this out yall!